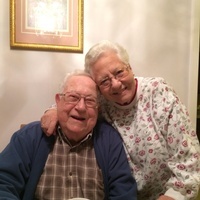 Southbury – Vincent DiTaranto, 93, of Heritage Village, died peacefully Sunday, July 22nd at the Lutheran Home of Southbury. He was the devoted husband of Frances (DiMiceli) DiTaranto. Mr. DiTaranto was born March 29, 1925 in Brooklyn, son of the late Vincenzo and Maria (Morganelli) DiTaranto. He graduated from Thomas Jefferson High School in Brooklyn in 1943. He worked in the garment industry in New York for most of his life, creating and sewing women’s clothing. He later retired as junior mortgage assistant at Apple Bank of New York. He was an active member of the Southbury Senior Center, where he called Bingo until last year and was noted by the New York Times as “Still calling Bingo after 15 years at 92 years young!”. Formerly of the Bronx, he and his wife moved to Southbury 26 years ago. Besides his loving wife of 65 years, he leaves three sons: Vincent and his wife, Karen, of Brewster, NY; John and his wife, Maureen, of Monroe, CT and Mark and his wife Emily of Rowayton, CT; one sister, Mary Morris of Queens Village, NY and 10 grandchildren – Vincent, Michael, Tony, Lauren, Christopher, Anna, Rosie, John, Allie and Juliet. He was predeceased by his siblings Rose, Dominic, Nicolina, Philomena. A Mass of Christian Burial will be held Wed. July 25th at 10:00 a.m. in Sacred Heart Church, 910 Main Street South, Southbury. Burial will follow in Sacred Heart Cemetery, Southbury. Calling hours: Tuesday from 4:30 to 7:30 p.m. in the chapel of Sacred Heart Church. Arrangements by Carpino Funeral Home, Southbury, CT.